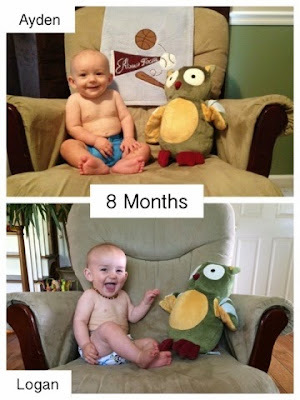 Life With the Ladniers: Happy 8 Months, Logan! Read about logan at 7 months here. I'll admit that makes me a little sad. With all we have going on, his first year is FLYING by. We try and do our best to savor it but it still feels like a blur. Yet another reason I am so glad I have put forth the effort to blog about it all. Logan is a fast crawler these days. He pulls to stand all the time and even will walk with anything he can push along. He has two teeth and took FOREVER to cut them. We recently discovered clove bud essential oil and use it on his gums wherever they seem to be irritated and it really seems to help (I tried it before giving it to him and it gives the same numbing sensation as orajel. Who knew?? We use doTERRA brand oils and dilute it 50/50 with fractionated coconut oil). 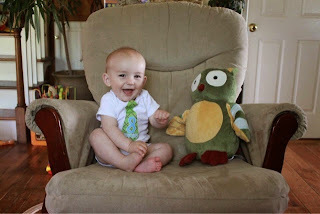 He babbles in all kinds of consonant combinations and though "dada" came before "mama", as of right now, whenever David encourages him to say "dada," Logan smiles and says, "mama." I'm not going to lie, I like it ;). He does not say it referring to me quite yet but I have a feeling it is on the way. If we ask, "What does a fish say?" He will open and close his mouth like an adorable little fish. He does the same "fish face" for kisses. If he wants us to pick him up he will crawl over to us and sit at our feet. When we say, "up?" he will extend his little arms so we can pick him up. His relationship with David has blossomed this month. David can get him back to sleep now if needed (which is AWESOME for me) and he lights up whenever he sees David in the morning or when he gets home from work. Dislikes: being tired, having a dirty diaper, having his hands/face wiped after meals (it is fine any other time for some reason), and his least favorite thing of all being put in his car seat anytime after 7:00. He'd MUCH rather be snuggled up in bed! Likes: Splashing in the dog water, taking baths, anything that resembles a stick (actual sticks, straws, the long tinker toy pieces, wooden pegs, etc), the pets, turning off light switches, being worn, banging on Ayden's new drum set, using the bar stools, the bottom step or the dishwasher door to stand up and play, being tickled, lots of kisses, the list goes on and on. While the likes list is still much longer than the dislikes list, Logan has cried more in the past month than he EVER did as a newborn. In his first 3 or 4 months he would literally go days without full on crying. He may have whimpered or whined here or there to let us know that needs needed to be met but it took a while for him to escalate. Now that he is mobile and more in tune with his environment, he is making up lost time in the tears department. He cries several times a day now but luckily he gets happy as soon as we pick him up. On the flip side, he is FULL of personality. He doesn't know a stranger and squeals in delight just as often, if not more, than he cries. Read about Ayden at 8 months old here. Life definitely got more hectic over the past month with the teething and the crawling and everything else. We are still adjusting to the new level of crazy but whenever there is crazy, there is fun! The boys are starting to play more and Logan is building up his strength and balance skills which makes him more sturdy when they do play. Ayden has been a big help and alerts us when Logan is doing or has something he shouldn't. He asks us if toys are big enough for Logan to play with before sharing them and just really cares about him. That is not to say that he doesn't still have "moments" where Logan is concerned but we can tell that there is lots of brotherly love between these two. The boys napped at the same time today. Logan woke a little early from his so I brought him out with me where he fell back to sleep. 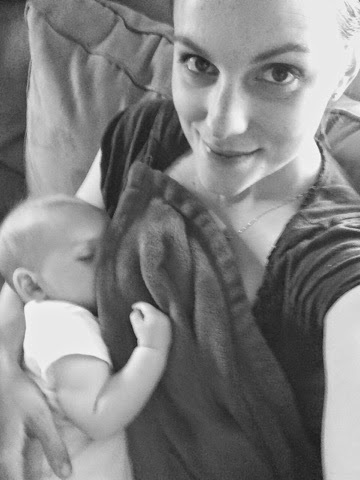 I'm on the go so much around here that Logan and I don't get to share these special moments as much as Ayden and I did (at least not during the day when I am awake to enjoy them) so I put everything on pause and soaked it in. It was amazing. I say it every month and I'll say it again, Logan has been a perfect fit. He balances everything out and we just don't know what we ever did without him. He is amazing. Flashback! Here's what we were up to one year ago today: "Choosing Happiness"
Two years ago today: "Mother's Day #2"
And three years ago today: "Daddy Day"
He is such a sweetie! 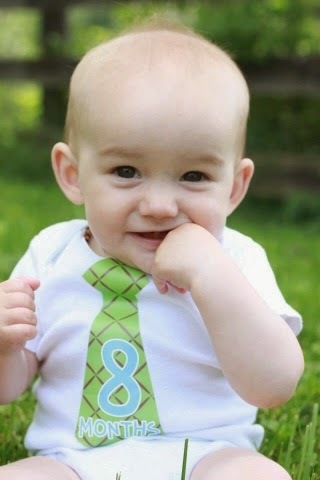 Happy 8 months, Logan!